Canada’s military: soldiers or psychopaths? This interview with Canada’s Chief of Defence Staff says more about the psychopathology of militarism than I would have believed could be found in a daily newspaper. Read along with me and ask yourself what kind of madness are we allowing to develop in this country. My thoughts are in the right hand column. I’d be interested in hearing yours. CALGARY – When it comes to future missions for the Canadian Forces, Canada’s top soldier has to battle to keep his eager troops satisfied with staying out of major combat zones for now. Our military exists, or should exist, to defend this country from aggressors while occasionally helping Torontonians dig out of blizzards and Manitobans fight floods. However, it seems that rather than guardians of national sovereignty and security we have a pack of blood thirsty attack dogs on a leash, restrained only by the herculean efforts of Chief of Defence Staff Gen. Walt Natynczyk. 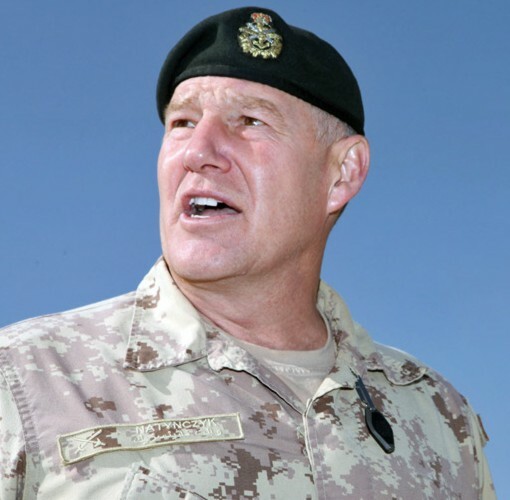 Canada’s military presence in Afghanistan will come to an end once the current training mission concludes in 2014 and Chief of Defence Staff Gen. Walt Natynczyk acknowledges that’s a disappointment for many soldiers, sailors and air personnel. If Natynczyk is correct in his assessment, we have allowed our military to become a haven for a large number of homicidal psychopaths. Is this what happens after a decade of war? “We have some men and women who have had two, three and four tours and what they’re telling me is ‘Sir, we’ve got that bumper sticker. Can we go somewhere else now?’” Natynczyk said in an exclusive interview with The Canadian Press in Calgary. These men and women need help. Failing that, they should never be allowed to own anything sharper than soup spoons. I like it when our troops are on hand to fight floods and forest fires. I’d prefer not paying taxes to help them make their bones overseas. If they are really that eager to kill people, our American cousins seem to have an insatiable appetite for cannon fodder. But Natynczyk is unsure about what is in store for the Canadian Forces or even himself for that matter. If you believe that, I have some prime muskeg, suitable for agriculture, that you won’t be able to resist. He has been on the job for four years, which is past the normal tenure for someone in his position, and if he knows what is going to happen next, he isn’t providing any details. “I’ll just keep on sprinting in this job until I’m told to get off the playing field and recognizing that I’m living in a pretty good time to be in the military,” he said. Ah, so many people to kill, so little time! If you really want to serve, Walt, there’s a Starbuck’s near you that is always looking for talent. Natynczyk said he is telling Canadian troops to keep their “kit packed up” because the world is an unpredictable place right now. Iran? Syria? Northern BC, if the First Nations don’t allow Enbridge to build it’s Northern Gateway Pipeline? “The world is turbulent right now and the fact is our allies want more of Canada, more of the men and women who wear Canadian uniforms,” he said. Our allies want us to kill more brown people who have the misfortune to be in some proximity to undeveloped fossil fuels. We happen to be good at it, I guess. We’re learning new ways to kill people every day. The general said outside of Afghanistan, Canada has a number of other smaller missions underway including in the Middle East, Africa and the Caribbean. Oh, and guess what! We’re opening up seven new military bases on foreign soil in Senegal, South Korea, Kenya, Singapore, Kuwait, Jamaica and Singapore. Natynczyk said he is satisfied with the success of the Canadian mission to Afghanistan and pointed out that he flew into Kabul on a commercial airliner for the first time when he visited troops in the city last month. Let’s see now . . . at great cost to ourselves and and a much greater cost to the Afghan people, we’ve helped a gang of drug lords maintain some control of a couple of urban centres which, when NATO leaves, will undoubtedly revert to Taliban control. The good news is, however, when the dust finally settles, commercial airlines will still fly into Kabul – just like they did before we invaded. He said the departure of Canadian and U.S. troops will give the Afghan forces the little push that they need to succeed. “It has helped the Afghans in a sense, taking ownership of their own security. One of the real challenges was the sense that NATO and our allies were going to stay there forever. (That) actually was not helpful in terms of their own culture and own atmosphere,” he said. Natynczyk is a master of understatement. Natynczyk is focusing much of his efforts now in making sure more attention is being paid to injured soldiers and their families, especially those suffering from the psychological effects of war. Shattered bodies and broken minds are the inevitable outcomes of war. Why is Natynczyk so eager to get into another one? “It’s almost easier to handle people with physical injuries, with physical wounds. People can see it. They can understand it, whether it be shrapnel, a broken leg, even these horrific amputations,” he said. According to The Department of National Defence, 19 men and one woman died by suicide in the Canadian Forces in 2011, up from 12 in 2010. Since 1996, 187 soldiers have committed suicide. How many more suicides are we going to tolerate while the military is figuring out the “complex nature of this”? Natynczyk said he talked about mental health on his last visit to Kabul, especially about overcoming the “stigma” of mental issues and making sure people come forward if they have a problem. And how’s that workin’ for ya, Walt?